★ Phone Bill Casino ★ MobileWins.co.uk™ - Play Now! 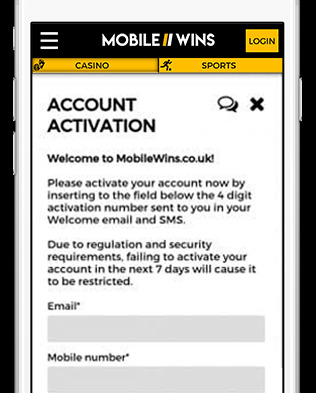 Here at MobileWins Casino you can deposit and play using your mobile phone bill. 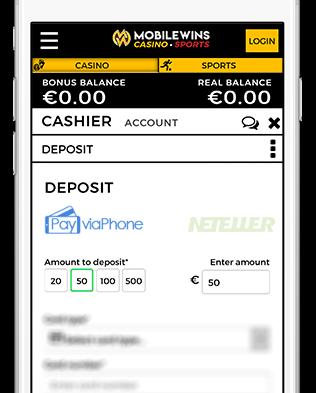 Deposit using your phone and receive a Welcome Bonus 200% up to $/£/€100 to play with at our Pay by Phone Bill Casino! Deposit using Your Phone and Claim your bonus! MobileWins Casino offers you the option to casino deposit by phone bill. By doing so, you receive a Welcome Bonus 200% up to $/£/€100 on your first deposit! For example, if you deposit £10 using your phone bill, we will automatically give you another £10 Bonus, meaning you will have £20 to play with! Play our wide selection of Mobile Slots right now. All slots we have can be played on mobile. Read more on Mobile Billing Slots or Mobile Slots here. Win big, play our jackpot slots here! It is super easy to casino deposit by phone bill. Follow our easy steps below. When registering make sure to enter your correct mobile phone number as we will be sending you a confirmation message with a code to secure your account. You will need this later! This will send you a confirmation email with your account details. Great in case you forget your username! 1) Click £10, £20 or £30 or enter a deposit amount of your own choosing. BOOM! You have just added £10, £20, £30 or an amount of your own choosing to your account using your phone bill for this casino deposit and we have also match up your deposit with a Welcome Bonus 200% up to $/£/€100! You now have your bonus as well to Play With!